I’ll give Donald Trump credit for one thing: he absolutely knows how to tap into the underlying desires of his supporters. While his incendiary words are a comfort to those who are a part of his Nixonian “silent majority” (though by comparison they are anything but silent), those same words for the rest of us — liberal or RINO conservative¹ — are nothing short of a disastrous charade. 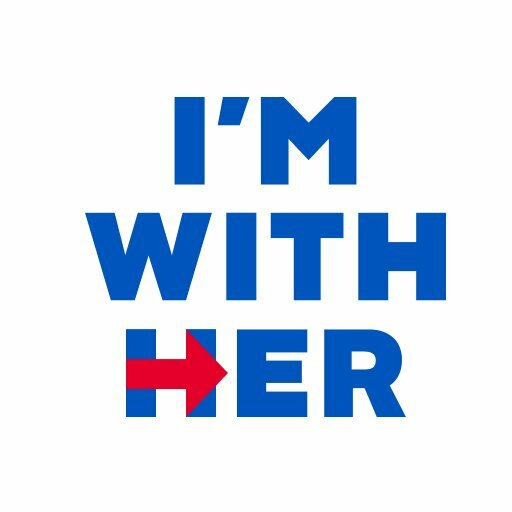 Let me clarify something at the outset: unlike other commentators and bloggers whom I admire, I am not supporting Hillary Clinton with any sense of excitement, passion, or even a feeling that she represents much of my own core beliefs. Time and time again over the years she has displayed an arrogance which I’ve found off-putting. From her callous “Tammy Wynette” comment, to the mysterious re-appearance of the Rose law firm billing records, to her apparent contempt of State Department civil servants who repeatedly warned her that it was questionable and inappropriate to bypass the agency’s own e-mail system, I have always understood and appreciated the general feeling of mistrust that she engenders. 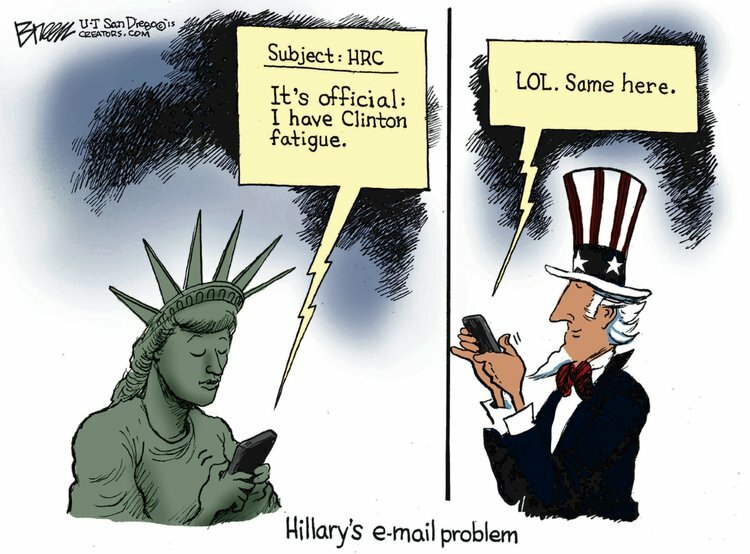 I also quite frankly have an acute feeling of “Clinton Fatigue” after nearly 25 years of her and Bill Clinton serving at the highest levels in the federal government. Like moths drawn to a flame, both of them are chronically prone to making dubious choices which are later scrutinized in an unflattering light. After years of repeated headlines, whispering campaigns, and congressional investigations, I prayed last year that a worthy (and younger!) challenger in the Democratic Party would surface. I felt the Bern, yes, but unfortunately Bernie Sanders also left me wishing for someone new, exciting, and different. Joaquín Castro, I’m looking to you in 2024. But for the love of God, I’m asking you what choice do we honestly have this time around? I for one will not drink any of the Kool-Aid that Donald Trump is serving to those who see him as someone who will upend the established order and restore “greatness.” Unfortunately that message is merely code to appeal to the worst of our collective impulses. He is perpetrating a con on not only the Republican Party, but also on those who are placing their faith and trust in him. This is not a man who should be anywhere near the levers of national security. I admit that my own faith and trust of previous GOP presidential candidates has tended to fall into a typical, knee-jerk liberal posture. Since at least Ronald Reagan, my view of each of their nominees mirrored the prevailing caricature offered by the Democratic Party, labor unions, and the left-leaning publications to which I subscribed. And as the U.S. has collectively become a divided nation of blues and reds, I’ve tended to stay squarely in my own blue corner, feeling safe and smug among my own fellow travelers, tossing rhetorical darts at those red front-runners. I can do better; we can do better. Of course, the Republican Party has also not made it easy for me either. Their unhealthy alliance with the religious right, which in turn spawned unprecedented legislative intrusions into women’s health rights and constitutionally questionable voter ID laws, made it all but impossible for me to really give their candidates any consideration. And, of course, there were the neocons of the Bush II era who got us hopelessly embroiled in the Iraq mess. They made it awfully hard for a liberal such as myself to close ranks with them, even when I was at times open to listening to some of their brighter lights (i.e. Paul Ryan) about Social Security and Medicare reform. But Donald Trump doesn’t in any way, shape, or form come close to the breadth of statesmanship offered by the likes of Ronald Reagan, Bob Dole, George H.W. Bush, George W. Bush, and John McCain. 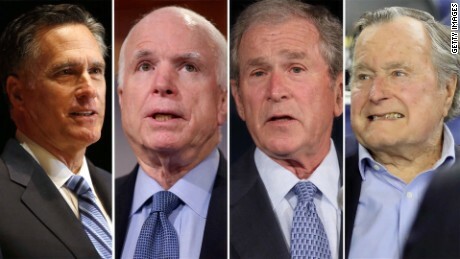 No matter the sometimes strong disagreements I had with each of them (particularly “W”), they were all men of unquestioned integrity who represented their country and party with distinction, particularly on the world stage. Trump not only makes it a point of pride not to emulate those qualities, but he doubles down on it with a glaring disregard for statecraft and statesmanship. The recent news that George H.W. Bush has decided to vote for Hillary Clinton comes as no great surprise to me. Nor is it a surprise that just today 75 retired senior diplomats signed a letter opposing Trump for president. I assume that this will be part of a growing list of more officials as we speed towards November. Simply stated, Donald Trump is not qualified, nor does he have the requisite character to be president. What he lacks of any understanding for the minutia of governance and policy details, he more than makes up in bombast, insults, and breathtaking recklessness. The incendiary quote that I’ve included at the top of this post is but one example among a slew of others where he has carelessly made injudicious and outlandish comments. What if as president he made a similarly provocative statement about, say, the Supreme Leader of Iran? I cannot imagine the repercussions, and yet the plausibility of such a moment actually happening no longer seems so remote. In a word, it’s scary to ponder. For all of her flaws, and I believe she has more than a few, Hillary Clinton brings a wealth of experience and understanding to both domestic and global concerns. She has been a fearless and tireless leader for children’s and women’s rights, civil rights, and for creating a level economic playing field for all working Americans. She is admired by Republicans, Democrats, independents, and world leaders. The choice could not be more stark and obvious. And…what exactly is a RINO? LOL. Oh…so I was close. Well, strap me to the side of a hog and roll me in the mud! A flying monkey is somebody who does the bidding for their narcissist. Ahhhhhhh! God, I could have used that line in this post then. 🙂 Thanks! I never knew that either. Thanks! Yikes, you went there didn’t you? I agree with most of what you’ve said but I really think that Clinton has been on the receiving end of focused, hateful, misogynistic, character assignations ever since she dared to be more than a docile First Lady (even when in the Arkansas governor’s mansion). She is not perfect by any stretch of the imagination, nor would I assert that she didn’t bring any of the negative attention on to herself by making some bad decisions, but she is supremely capable – both in intellect and temperament – to be president. It makes me nuts to hear the media talk about having two flawed, unpopular choices for president. We have one qualified candidate and one psychopath. Take your choice. Thanks Janis, and I really do agree with you on the sexist attacks that she has had to endure over the years. Just in recent weeks, those who criticized her when she was recovering from pneumonia crossed over that line way too often. She is indeed supremely capable to handle the job. Thanks for reading! I agree with Janis about Hilary. (There is no way I could run for any position as my skin isn’t thick enough!) You’ve made the points very clearly. I cannot understand how so many people (so it seems or is that Trump’s team creating it) are on board with him. I attribute it to reality TV desensitizing people on what is appropriate and not appropriate. Bluster seems to get more followers. I have seen so much blatantly incorrect info floating around (one person criticized Obama for his appearance as president during 9/11 — hello? Remember Bush?). People believe that stuff. After all it’s on the internet. There are so many sites now devoted to busting myths, but people are lazy and will grasp onto what they read on social media (i.e. Facebook) or worse — by tv talking heads (i.e. Fox News). It makes my head hurt. I’d like to nap for about 6 weeks and wake up to a wonderful surprise. From a distance, it simply looks insane that Trump is a contender. That a hate-filled misogynistic buffoon can get this far is truly scary. I can only imagine what it feels like up close. When you put that lineup against Trump, it makes me feel bad about all the hard things I said about them. (Except Reagan. Oh and W). I have found myself thinking fondly back at NIXON, who, crook though he certainly was, signed most of environmental laws and supported them! As you noted, I have become more positive about my support for Hillary Clinton. I’ve read more, listened more. When I separate myself from my own case of Clinton fatigue, I find I am quite content with her policies, her vision, and her finger on the button. Still the alternative is unthinkable! Glad you finished this. It’s a good post, and it would have been a shame to waste it. Thanks, Elyse. Your post gave me that kick in the pants to finish this. Yes, it is amazing how MODERATE Nixon was when we look at him through the prism of history. As you mention, it’s hard to believe the number of environmental laws that were passed under his administration. If I’m not mistaken, wasn’t the EPA formed then also? And, yes, the alternative in this election is completely unthinkable. My issues with Hillary are quite minor in the grand scheme of things. And my, is that scheme ever grand. Thank you so much for this post (and for the readers’ comments above). As a Canadian (whose husband loves to have the news on at all times) I stand in absolute horror of what I have been hearing on the coverage of the US elections. Your post has offered a perspective that makes much sense. Just in case anyone thinks that Canadians should not care about the outcome of the US Presidential Election, geopolitics should make them think again. PS – How far are you now in ‘The Way We Live Now’? Thanks so much for your comment, Donna. Elections absolutely affect our relations with other countries, and I think the voters sometimes forget that. And what country is more important to us than Canada, for God sakes?! OMG, I’m so behind with “The Way We Live Now.” I’m only on page 94, but interestingly I really am starting to get into the story finally. I just need to buckle down and focus on it. Thanks for asking! I do believe that Hillary is the only choice and as others have replied above, I’ve warmed to her more in recent weeks. I remain worried that many people do not understand what they are signing up for with a vote for Trump. As the election nears, I have a lot of anxiety about the potential of a Trump presidency……. On the upside, I can now add RINO and flying monkey to my vocabulary! I love that so many of your commenters are actually listening/reading every side. What I have found is that people are against Hillary have never listened to a speech of hers. The same goes for Obama. How can you operate in a vacuum and be so opinionated? It could be the the strength of their opinion is inversely proportionate to their knowledge (the less they know the stronger their hatred or views). I think your observation is right-on, Barbara. One of the tragedies of our blue/red nation now is that we all collectively tend to stay in our virtual corners and pay attention to only what “our” kindred crowd is saying. There’s not much listening going on. It is a monumental disaster that he is out there in the spotlight. I would like our country to be balanced with sane, caring leaders representing each party so we could just focus on the issues and where the candidates stand in relation to our own varied, personal beliefs. I watched the PBS Front Line special on both candidates last evening and the contrast could not be made any more stark. Their backgrounds and past experiences explain so much about who they were and who they are now and reinforced my bewilderment that any woman could even think of voting for him. He abhors any woman not of Stepford Wife quality. What an insult to us all! So perfectly said, Clare. After the last election the GOP supposedly did a post-mortem on what went wrong, what groups they needed to finally recognize, what issues they had to finally accept, etc. But none of that came to pass. I’m up late working on my next post. I never wanted to discuss politics in social media, but how can it be avoided at this moment in time? It’s almost a responsibility for saner minds to express how they feel. I would love to be writing about music or children’s books or even letting Roxie take the stage, but everything is just being pushed aside to make room for all of the questions I have about the state of this country. I know others are feeling the same way and have come forward to express their views and share feelings of angst. But I wonder if it will be enough in the end?